After 27 years of service to this community, Donna Mauldin has announced the sale of the Northeast News and associated publications to Gilbert and Mei-Ing Hoffman, who become the new owners and publishers. The Hoffmans are the publishers of others newspapers on the east side of Houston. They publish the Highlands STAR-Crosby COURIER and the Dayton Barbers Hill PRESS. Also included in the sale were the Frugal Frog and the North Forest News. They plan to continue to serve the same readers of these papers as before. The combined circulation of all 5 newspapers now numbers 62,000. 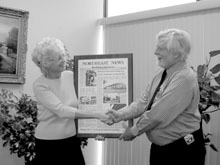 The Northeast News has been published continuously since April 1977, when Donna Mauldin and her husband Vic Mauldin realized a dream to publish their own newspaper, after years of working in radio and for other newspapers. A relatively new concept, the free distribution newspaper delivered by adult carriers to homes, allowed them to start with a circulation of 25,000, which has grown steadily over the years. Vic was well known locally and in state press associations for his strong professional approach to community journalism, and the News won many State and National press awards. Both Mauldins have had a strong interest in the community they serve, and after Vics untimely death last year, Donna continued this legacy of service, both through the newspaper and community organizations such as the Aldine CID. Specialty publications are a part of the Northeast News family, with the North Forest News serving 13,000 readers in that neighborhood, and the Frugal Frog distributed at drop stations with Classified Ads targeted to a geographic area not served by other publications in Northeast Houston. This area is from Antoine Drive to Mesa Road on the east, I-10 on the south to FM1960 on the north. In addition to their newspaper business, the Hoffmans have other business interests, including a printing business that services local and national accounts, business, educational and cultural institutions, and government contracts. They print about a dozen high school and private newspapers around the city, as well as their own. Their government clients include the Post Office, the IRS, and several branches of the Department of Defense. Another interest of the Hoffmans is their architectural practice. They maintain an active consulting architectural design practice, an outgrowth of years of work with some of the largest architectural firms in the city. Their work includes local banks, libraries, and medical buildings. They are currently consulting on the design of a classroom/engineering building for the University of Texas at Tyler, and a pharmacy college for the Texas A & M campus in Kingsville. Hoffman indicated that his intent with the News is to continue the close contact with the community and the school districts, and to expand the news coverage and features. The publications provide complete coverage of the entire northeast quadrant of Houston, and the close-in suburban areas beyond. The five publications offer readers and advertisers a low-cost, effective way to build recognition, community acceptance and sales.